Antonio Habas' presence in the Pune City dugout proved to be no good luck charm for the Stallions as they were held to a 1-1 draw by champions Chennaiyin FC in Pune. FC Pune City had never won against Chennaiyin heading into this match. They were also staring at their worst-ever start in the Indian Super League. Having collected only four points from four matches this season, anything but a win against Chennaiyin would have confirmed Pune City's worst start in ISL history. In a situation where the Stallions had to face their bogey team, as well as recover from a poor start, the return of Habas was expected to be a welcome boost. "I am 100 percent confident that tomorrow will be a good result for us. This is my profession, I trust my players 100 percent," Habas declared ahead of the match. But despite their spirited display in the second half, FC Pune City had to be content with just one point against a disciplined Chennaiyin outfit. Habas handed winger Sanju Pradhan his first start of this season, while Gouramangi Singh made way for Eduardo, who returned from his red card suspension, in the centre of the Stallions' defence. It was a 4-4-1-1 setup for Pune City; Jesus Tato operating in a withdrawn role behind centre forward Dramane Traore. The Orange-Purples had a balanced and well-spaced out system in place. There were positional interchanges behind Traore, with Tato, Jonatan Lucca and Sanju combining well. But there was a sense of deja vu in the way the home side conceded the opening goal. Despite controling the run of play, the fragile Stallions defence needed just a one-pass Chennaiyin move from back to front to concede. 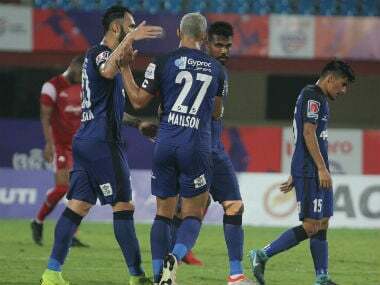 A long, hopeful ball from Chennaiyin's Jerry Lalrinzuala caught the Pune City defence off guard, and Jeje duly punished the home side with a lobbed finish over Edel Bete in the 28th minute. The Stallions are yet to keep a clean sheet, and conceding goals has become a major problem for them since they don't quite have the firepower in attack to compensate for defensive lapses. 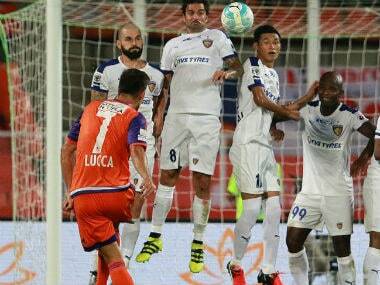 And against the disciplined Chennaiyin FC, Pune City had to virtually scale a mountain. The Marco Materazzi-led Chennaiyin were impressive in their 1-0 away win over NorthEast United on Thursday, and they looked to repeat the performance at the Balewadi Stadium. at all times, with Hans Mulder playing as a runner to link up with his teammates in attack. But, it was an unlikely intervention that resulted in both sides sharing the spoils. Anibal Zurdo was not even slated to make an appearance, but the 33-year-old ended up making the difference for Pune City. With Gustavo Oberman coming on and going off inside 15 minutes in the second half, Zurdo replaced the Argentine, and within seconds of coming on, he scored the equaliser for the Stallions with only his second touch. He struck a near-perfect free-kick that kept up with the standard of goals in the match. After Jeje's fine first half strike, Zurdo came up with a better one. 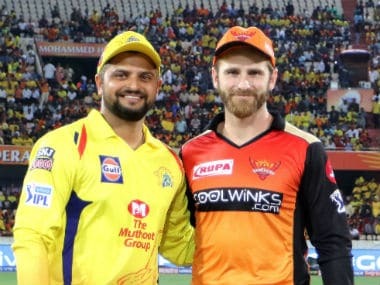 It was a classic game of football where one team cancelled out the other, but Pune City would perhaps feel aggrieved that they did not make the most of yet another home fixture. They were persistent, never stopping in their quest to find a rare opening inside the Chennaiyin box with their barrage of crosses. Up front, Traore tried hard, creating goalscoring chances on the half-turn and from difficult passes. But it was the striker Zurdo, pushed out of the Stallions' starting eleven, who scored the equaliser. Unlike Emiliano Alfaro for NorthEast, Marcelinho for Delhi Dynamos, Matias Defederico for Mumbai City and Iain Hume for Atletico Kolkata, Pune City don't have an outstanding attacker in their ranks. 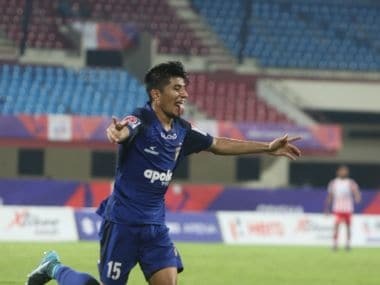 But Zurdo's first goal in India is the kind of marginal confidence gains that the Stallions will hold on to heading into their next match in Delhi on Thursday. Chennaiyin's blueprint was almost perfect, but Pune City probed and prodded. If Chennaiyin didn't allow central access, the Orange-Purples attacked from out wide. If Pune City somehow built up centrally, Chennaiyin made sure to foul them. One such moment handed the Stallions an opportunity, and Zurdo seized it. Habas's return didn't turn out to be an occasion to celebrate for Pune City, but there were enough signs that prove they are not out of the race yet.